This page provides information about the RicksPlates.com – Rick Kretschmer's License Plate Archives web site. May 6, 2018 – Updated the photo of the license plate on my personal vehicle. June 8, 2017 – Updated the photo of the license plate on my personal vehicle. RicksPlates.com – Rick Kretschmer's License Plate Archives is my personal web site. I'm Rick Kretschmer (obviously), a collector, historian, and spotter of vehicle license plates. This site covers various topics related to historical and current license plates, as well as the hobby of collecting expired license plates. Featured throughout this site are photos of license plates from my personal collection, and photos I've taken of current license plates in actual use. Read more about me and license plate collecting on the About Rick and His License Plate Hobby page. On this site, the term "license plate" always refers to motor vehicle and trailer registration plates issued by various government agencies for the purpose of vehicle identification and sometimes as evidence of payment of vehicle taxes and fees. In some parts of the U.S. and elsewhere in the world, license plates are commonly referred to as tags, license tags, or number plates. I do not use these alternate terms because they're not universally used or understood. The term "license plate" is never used to refer to novelty or booster plates that advertise car dealerships or promote sports teams, commonly placed in the front plate position on vehicles registered in states that only issue single license plates. Such plates are not license plates, because they're not issued by states or other jurisdictions to show that a vehicle is registered, or licensed, to be driven on public roads. When describing license plate colors, the color of the registration letters or numbers is always given first; the background color is second. For example, "orange on purple" means orange on purple – orange letters or numbers on a purple background. A lower case letter "x" in a serial format or an example serial number indicates the position of a variable letter. A number 0 in a serial format or an example serial number indicates the position of a variable number. An upper case letter in a serial format indicates the position and value of a letter that is constant. A number 1 to 9 in a serial format indicates the position and value of a number that is constant. An upper case letter, or any number 0 to 9 in an actual serial number indicates the actual letter or number in the serial number. A dash "-" in a serial number format or a serial number indicates a non-graphic separator (usually embossed) on the plate in the position indicated. An asterisk "*" in a serial number format or a serial number indicates a graphic separator (usually screened) on the plate in the position indicated. A space " " in a serial number format or a serial number indicates a space on the plate in the position indicated. A slash "/" in a serial number format or a serial number indicates that the character(s) before the slash is/are stacked vertically above the character(s)after the slash on the actual plate in the position indicated. Usually there is no actual slash character on the license plate. All photos on this site that were taken by anyone besides me are identified as such, and credit is given to the photographer, in the caption immediately below the photo or group of photos. Put another way, any photo which is not attributed to someone else was taken by and is owned by me. Usually, any plate shown that is not from my own personal collection is also identified as such. On most pages, such plates are the exception rather than the norm, and so it isn't burdensome to identify the exceptions. On the various Current and Recent pages, however, a number of the photographs are of plates in actual use on registered vehicles, but are not explicitly identified as such. On the Pictorial Guide to License Plate Grading page, the Current and Recent U.S. Passenger Car Plates page, and the various North Carolina pages, some of the plates shown either previously were or currently are in my trade box, rather than my collection. Plates previously in my trade box are plates that I once owned, but have since traded or sold to someone else. Again, such plates are not individually identified on these specific pages. I began actively collecting license plates in August 2003. As my collection began to grow, I soon realized that I wanted to be able to display my plates, for my own enjoyment as well as that of others. However, I had no suitable place to physically display my collection, and even if I did, I knew that very few people would ever see it. Also, although I had thoroughly enjoyed the many license plate sites I had found on the web, none really presented much in the way of a history of Maryland or Pennsylvania plates. I had a lot of knowledge about plates from these two states in my head, and was working toward building a nice collection of plates from both states. 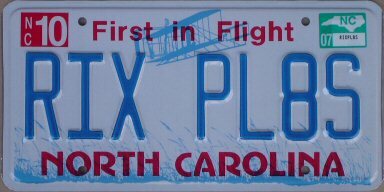 So, I decided I wanted to build my own plate web site, with both pictures of and lots of historical details about license plates. of this site, and again in 2008. I began creating my license plate web site in March 2004, and by April 2004 I had gotten a few pages in good enough shape to let the world see them. At first, I took advantage of my internet provider's free web site hosting service; however, they required me to use their long, cryptic web address for my site. The first few pages published included Rick's 1959 U.S. 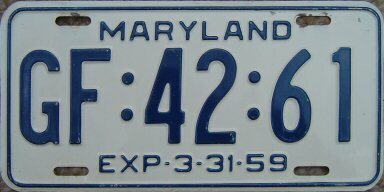 Passenger Car Plates, Rick's U.S. State Anniversary Plates, and A Pictorial History of Maryland Passenger Car Plates Dated 1954 to Present. The Extremely Important Matter page came about in December 2004, when I woke up in the middle of the night with an unexplainable, very strong feeling that I needed to include the Christian plan of salvation on my site. While I've never audibly heard God speak, and don't ever expect to, this experience was pretty close. Of course, I made this task a high priority, and I spent the next several evenings finding the most appropriate verses of scripture to quote, writing the narrative, and otherwise building the web page. That page, or one like it, will always remain a part of any web site that I operate on my own behalf. vehicle and my home page. With the free web hosting I was using, I was limited to only 10MB of storage, and within a year I had completely maxed that out. I wasn't satisfied with the web site as it was then; I still had a lot of content that I wanted to be able to add. But since this is a personal hobby site, and since I'm not at all rich, I wasn't willing to spend much money to get additional storage – certainly not the prices my internet provider was asking. Being a basically thrifty guy, I shopped around for a cheap web hosting service that offered enough storage for me to continue to grow my site. I had no difficulty finding just that. So, in April 2005, I obtained my own web domain name, www.ricksplates.com, and moved my site to the new web hosting service, where I won't run out of room for a very long time, if ever. Originally, not knowing any better, I created the pages on this site using HTML code that had not been validated and was full of errors and inconsistencies. As long as it displayed well in the version of Microsoft Internet Explorer (IE) that I had installed on my computer, I figured I was okay. I subsequently discovered that different web browsers interpret HTML code slightly differently, especially when it is invalid code, and so people who viewed the site using Firefox, for example, were seeing some pretty funky looking web pages, even though they looked fine in IE. So, in 2006, I went through each page on my site and made sure that its HTML was valid HTML 4.01 Transitional code, ensuring that most web browsers would be able to display the page without difficulty. At the same time, I also began using CSS to do some things presentationally that can't be done in HTML, such as changing the color of links when the cursor moves over them. In 2008, I learned a lot more about current web design methods, and based on this, I began working on bringing my HTML and CSS into the 21st century, and trying out some new coding techniques that I haven't used before. Now, nearly all of the pages on this site now use valid, non-deprecated XHTML 1.0 Transitional code, along with CSS for page presentation. Updating and adding to my license plate web site has become as much of a hobby for me as the actual collecting. I've continued to add to my site as my collection has grown, as I've done additional research, as I've taken photos of plates actually in use, and as visitors to my site have sent me plate photos. The majority of the license plates shown on this web site are from my personal collection, however. I'm a computer programmer by profession, so rather than go out and buy web page software, I taught myself HTML and CSS, the primarly programming languages used to display web pages. I've personally written all of the HTML and CSS code behind every page on this site myself. Actually, HTML and CSS are easy to learn; even a non-programmer with a little bit of technical aptitude should be able to pick it up quickly. And they're free. I use Notepad, which is pre-installed on most every PC, to enter the HTML and CSS code. You can see the HTML code for most any web page anywhere on the web by right-clicking on a blank part of the page, and click on "View Source" in Internet Explorer, or "View Page Source" in Firefox. All of the HTML code on this site is valid XHTML 1.0 Transitional, or in a few cases, valid HTML 4.01 Transitional. XHTML 1.0 is a more recent version of HTML than is HTML 4.01. The "W3C XHTML 1.0" or "W3C HTML 4.01" logo that's at the bottom of each page indicates that that web page has been validated, meaning that the HTML code follows the rules and syntax of XHTML version 1.0 or HTML version 4.01, respectively. The CSS code has been validated as well. This means that web browsers that support XHTML 1.0 or HTML 4.01 and CSS (most all do) should have no problems presenting that page. If you click on the W3C logo on any given page, that particular page's HTML will be re-validated and you will be shown the results. W3C stands for the World Wide Web Consortium, an international group that develops web standards. Most of the plate images on this site were taken using a 3.2 megapixel Sony Cyber-shot DSC-P72 digital camera that I bought in February 2004. Normally, I have the camera actually set to 1.2 megapixels. I use Paint Shop Pro to straighten, crop, and resize the images. Lately, I've really been making a serious effort to make sure the plate colors in new photos accurately relect the plate colors in real life. This can be a rather tedious and sometimes quite difficult task. My web hosting service is BargainVault.com. I've been completely satisfied with them and I recommend them. Their prices do live up to their name, too. This web site is intended for personal use and enjoyment only. All text and photographs throughout this web site © copyright 2004-2018 by Rick Kretschmer, except where noted. All rights reserved. All content on this web site is, or is presumed to be, copyrighted material, and may not be reproduced or distributed in any way without express written authorization from Rick Kretschmer, the author, photographer, programmer, and owner of this web site, and/or from other authors or photographers whose works are credited and have been included with permission from their respective owners. The sole exception to this policy is that material from this web site may be downloaded or printed for personal use and enjoyment only. Unauthorized copying of my text or images onto other web sites or other electronic or printed media constitues copyright infringement and is not permitted. However, if you want to use my stuff, ask me; I'm not an unreasonable guy. Links from other web sites to images hosted on this site (commonly called "hot links") constitute bandwidth theft and are expressly forbidden. Linking from other web sites to this site's domain name (home page), or to specific .htm files (web pages) on this site, is perfectly acceptable and is encouraged. Although I strive to make all information on this site accurate and complete, I make no guarantee that such is the case. I cannot be responsible for any loss that may result from relying on this information. All license plates offered for sale or trade are real, expired plates for collecting, display, or other hobby purposes only, and are not legal for street use on any vehicle, except possibly in some specific cases for registration of antique vehicles under state Year of Manufacture laws. Recent-issue plates of types that are still used for current registrations, even though the specific plate offered is expired, are therefore offered only to individuals whom I can verify are bona fide license plate collectors. 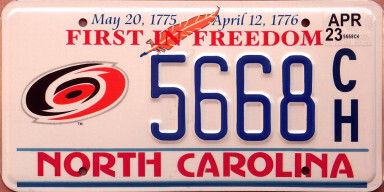 Plates with designs that are no longer used for current registrations are available to the general public. I make no claim or warranty that any license plate on this site qualifies for Year of Manufacture usage; the burden is upon the buyer or trader to make such a determination if it is material to the transaction. Thy buyer or trader warrants that any license plate obtained through this web site will not be displayed or used on any vehicle except in compliance with all applicable laws. The buyer or trader obtaining plates also certifies to hold harmless the seller or trader providing the plates for any damages that may arise from any improper use of these expired license plates. I reserve the right to refuse to do business with anyone, for any reason or no reason. This web site will never prompt you to provide or submit any personal information in order to view it. This web site does not collect any personally-identifiable information about anyone who visits, nor will this web site put a "cookie" or any other tracking mechanism on your hard drive. If you send me an e-mail, I will not disclose to anyone your e-mail address, your name, or any other personal information you may provide, without your permission. I will not add you to any mailing list. I will not send you bulk unsolicited e-mail (spam). I will generally not e-mail you at all, except in response to your query. If you provide me with license plate information which I then use in the narrative text on this web site, I may or may not credit you by name, at my discretion. If you send me a photo of a license plate to use on my site, and I decide to display it on or link to it from one or more of my web pages, I will credit you by name for the photograph on each of the pages on which it appears or is linked from. If you do not want to be credited by name for the photo or information, please either request that I not identify you by name, or don't provide your name in the first place. I will honor all such requests to not identify you by name. However, if you're too secretive about it, I may just decide not to use your photo or information at all. If you send me a photo of a license plate for some purpose other than for me to display the photo on this web site, for example, to show me a plate that you have a question about or are offering to sell, I will not use that photo or your name on my site without your express consent. It is my intention to only use on this site photos that I have taken myself, as well as photos for which I have received permission to use from the person owning the rights to the photo (normally the original photographer). I don't knowingly use photos from eBay or photos from any other online source, unless the site owner or eBay seller has clearly indicated that it's acceptable to do so, or unless I have obtained written permission to do so from the site owner or eBay seller, and it's stated or understood that the site owner or eBay seller is the actual owner of the rights to the photo. It's possible that some photos submitted for inclusion on this site were misrepresented and the photos do not belong to the person who claims to own them. Therfore, if a photo that you own the rights to is displayed on this site without your permission, and you object to it being here, or you wish to receive proper credit for the photo, please contact me, and I will try to accommodate your request. However, I may require evidence of the ownership of the photo before taking any action. Photographs of license plates currently in use are shown on this site. The purpose of showing a plate in use is to provide a visual example of the plate's design and/or numbering format. To protect the privacy of the person(s) owning or driving the vehicle to which the plate is registered, it's my policy to never show or describe the vehicle's occupants, the vehicle itself, or its location when photographed. The actual plate number, although visible, is not of any particular interest. Please realize that license plate numbers are not sensitive personal information like Social Security numbers are. After all, they're on display for thousands of people to see every day. Also, there's generally no way to connect a plate number to a specific individual without access to a police or DMV database, and those are highly secure. I hope you'll realize there's no harm being done and no privacy being invaded here. To show my sincerity about this, pictured at right is the plate currently in use on my own personal vehicle. In any case, if a license plate currently registered to you is shown on this site and you object to it being displayed, contact me and I will most likely agree to remove the photo in question. However, I reserve the right to require evidence of the plate registration in your name before doing so. Also, I will not honor requests to remove photos of expired license plates that are or were in my collection or trade box, even if the plates were once registered to a vehicle in your name.